Visiting Toronto? Here’s What You Need to Know! Is Toronto worth visiting? That answer is a huge YES! As one of the biggest cities in North America (bigger than every US city besides New York and LA), Toronto has plenty to offer visitors checking out Ontario. Having grown up north of Toronto as well as living and working in Toronto for a while, we like to think we know a thing or two about Canada’s largest city! Toronto tourism is always booming – especially in the warm summer months but even the dead of winter! Spending One Perfect Day in Toronto! Lake Ontario plays a huge role in shaping the city! 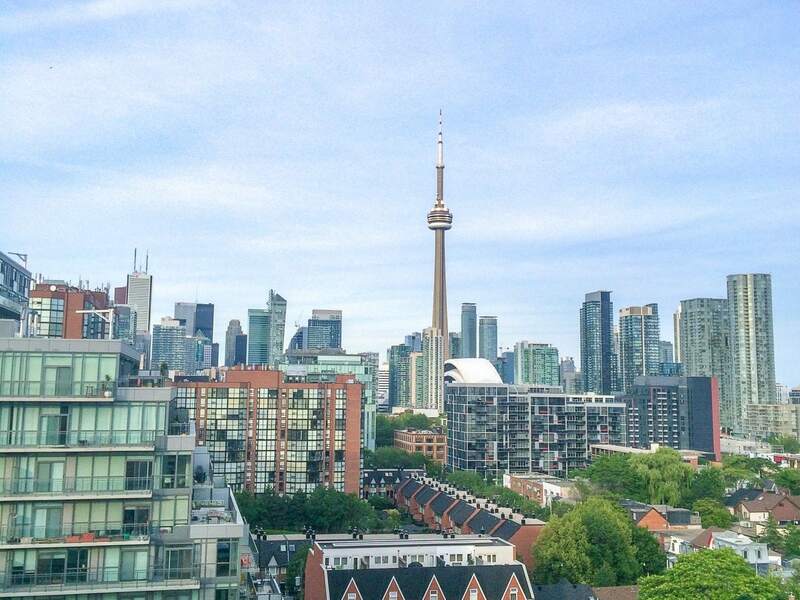 As the capital of Ontario and Canada’s largest city, Toronto has a lot to live up to! This diverse city of over 2.5 million people is bustling with life everywhere you look. The city sits right on the shores of Lake Ontario – which is great for boating but creates interesting climate/weather all year around! Now, keep in mind that in this post we are talking about just the city of Toronto. Toronto is part of a larger area called the GTA – or the Greater Toronto Area – which includes the city core and the surrounding regions of Peel, Durham, Halton, and York. For your visit, you don’t really need to know about these areas if you are sticking to the city centre of Toronto. That said, the next biggest cities in the surrounding area are Mississauga, Brampton, and Markham. Some people even include Hamilton in this mix – and then it gets even more complicated! Toronto actually has a long history behind it. First a settlement by Indigenous Peoples, it was part of a trading route that led to other lakes in the north of the province. The French settled there, then the British, and it was made the capital of Upper Canada to be called “York”. There was a Fort built – Fort York – but then it was attacked and sacked by Americans in 1812 (but then we burnt down the White House). The city grew as immigrants settled in from abroad and eventually the city became “Toronto” in 1834 (before Canada was even a country). Since then, it has grown out over time – essentially eating up smaller neighbourhoods as it went to become Canada’s economic and cultural powerhouse that it is today. You can revisit some of the most historical elements of Toronto when you check out St. Lawrence Market, Old City Hall, and Queen’s Park. Here’s Lisa being very safe in Toronto! As far as large cities go, there is no guarantee for complete safety. Having said that, Toronto is considered a very safe city to live in and visit. The downtown core especially is a safe area. However, as a visitor to Toronto (as with any place you are unfamiliar) you should watch your pockets – especially on the TTC (public transit, see below) and at tourist attractions. Besides that, watch out for bikes and streetcars when you cross the roads – and follow the pedestrian signals or else you might get a fine for jaywalking! While it’s completely safe to be out at night – do be mindful of your surroundings depending on the areas you are going out in. If you stick to the Entertainment District, Queen Street, or Ossington, it’s a safe bet there will be plenty of other people around. Nothing like a flight of beer on a patio in the Distillery District! Largely because of the lake, Toronto has four distinct seasons that you can experience. That said, the seasonal temperature fluctuation can basically go from -30 degrees Celsius in the cold of January winter to +35 degrees Celsius in the summer in August. Another thing to remember is that Toronto summer is nicer in May and June as opposed to July and August. Toronto is notorious for humid heat in the summer so you may sweat even if you are in the shade! As we said, the best time to visit Toronto would be the early summer or even in the fall. September and October can be cooler but September still has the chance of some residual summer heat. You also get the beautiful autumn colours on the trees which some people pay big money to see! A shot from Pearson Airport – the largest in Canada! With the airport code YYZ, Pearson is the largest/busiest airport in all of Canada. While the airport handles domestic flights, it is the main hub for international destinations. If you need to learn more about Pearson, you can check out Pearson’s website here. Now, keep in mind that Pearson is NOT close to downtown Toronto. The airport is located in Mississauga which is outside the city centre. However, you have a few options to get to downtown/the city centre. You can take a cab or airport shuttle to your hotel but this option can be expensive. Luckily, if you are heading downtown (to then go to a hotel or take public transit to another place in the city) you have one great option: The UP Express Train. The UP only opened a few years ago and we’ve already taken it countless times. Eric grew up in a time when the UP didn’t exist so the fact that there’s a direct train link between downtown Toronto and the airport is awesome (and makes loads of sense). With the airport code YTZ, Toronto also has Billy Bishop Toronto City Airport – a small island airport which flies Porter Airlines and Air Canada to short/medium distance flights to the US (New York, Chicago) and other places in Ontario/Canada. If you do somehow fly into Billy Bishop, you can take the ferry from the island or walk (in a tunnel) from the airport to the mainland which is downtown Toronto. You can learn more about Billy Bishop here. Eric has flown through Billy Bishop a handful of times and it’s been really nice each time. It’s a small, well-functioning airport! To get to Toronto, you have a few options: you can drive, take the bus, or take the train – either the ViaRail or the GO (regional Ontario train). If you have rented a car and are driving, downtown Toronto is encased by a highway “box” of four major routes: the 401 runs east-west at the north end of the city, the Highway 404/Don Valley Parkway runs north-south to the east, the Gardiner Expressway runs along the waterfront at the south, and Highway 427 runs north-south on the west side of the city. The main transport hub is Union Station which is right downtown on Front Street. This massive hub (which is basically always somehow under renovation) is the busiest station in Canada and handles passengers heading every which way on buses, regional, and long-distance trains. You can check out more information about Union here. Once you are in Toronto, you will have the experience of riding the TTC. The “Toronto Transit Commission” is responsible for public transportation in Toronto. Lovingly known as the TTC, it will get you from A to B eventually. We say this because the system is prone to delays for a variety of reasons. That said, it’s reliable most of the time. The TTC is made up of the subway, buses, and streetcars. The subway is good for going north-south across downtown, while the streetcars and buses fill in the gaps on major streets. Toronto is basically a giant grid system so it’s pretty easy to get around if you have your bearings about you. Recently (start of 2019), The TTC is doing away with tickets and tokens to ride transit in favour of electronic “tap” cards called Presto. You can now just buy a Presto at a vending machine ($6.00) and load it with money (minimum $10.00). Kind of pricey for a visitor, but it’s the easiest way to get around. It didn’t use to be this way – and the system still has kinks, but it’s better. Trust us. To use the Presto, just tap to get “on” the subway, streetcar, or bus and tap again if you transfer between modes of transportation. Presto card users get to use the “two-hour transfer” rule meaning that from the first tap you have two hours to basically get on and off and go in any direction you want – all for the price of one fare. Just tap each time you change vehicles or directions. Fares are not based on distance so you don’t have to tap “off” or out of the system again. You can learn more about TTC fares and schedules here and learn about the Presto Card here. You can also still use cash but only when there is a manned payment box on the bus or in the subway station. If you do pay with cash or a method that is not Presto, remember to take your paper “transfer”. It’s your Proof of Payment for the ride. Driving in Toronto isn’t terrible since it’s a big grid – but it can get pretty congested in the morning and afternoon (after work). Parking downtown can also be expensive. You also have the option to take an Uber, Lyft, or taxi. Toronto is a big city with lots of drivers usually available. Us enjoying Woodbine Beach – all to ourselves! Toronto is known to be a “city of neighbourhoods” in the sense that you can walk from one and into another and feel like you’ve switched countries let alone the street. We’ll mention below just how diverse Toronto is – but it shows in the areas around the city! For those who live there, it’s no secret: Toronto is a diverse city. How diverse? Toronto has been named the most diverse city in the world with over 200 nationalities represented, 140 languages, and 51% of residents being born outside of Canada. It’s no wonder that there are so many little international pockets all over the city: Little Italy, Koreatown, etc. The language spoken in Toronto is English, but French is also an official language of Canada. That said, you are more likely to hear literally any other language in a Toronto coffee shop before you hear French. Seriously. That said, one time in a coffee shop in The Beaches Lisa ended up having a brief conversation with a woman in her native language – German! The woman (who also lived in Toronto) was so surprised to hear German spoken that wasn’t her young kids. Case and Point – try Korean hot pot in Koreatown! This rich culture and diversity are certainly represented in the available food around the city. Toronto has a booming food scene – and you will get to experience it if you head to Toronto. You can basically find any cuisine from across the world in Toronto – and that is not an exaggeration. That said, Toronto is known for its brunch culture. There are brunch places everywhere – and the weekend mornings are sacred brunch time. If you are heading of brunch be sure to be early or expect to wait a bit! There are loads of great brunch places and we will write a whole post on them soon! Head to Bar Hop – you will not be disappointed! Toronto also has a strong coffee culture. Canadians (in general) drink a lot of coffee compared to other countries so cafes are a very common occurrence around the city. You can try Tim Hortons – the classic Canadian brand – but explore the city for tiny coffee shops… they pop out of everywhere! Finally, Toronto has a strong bar/pub/club culture – being a massive city. The Entertainment District is a good place to start if you are looking for a place to go out for drinks or dancing. There are other pockets to go out in (like Ossington) but generally, you’ll find bars all over the city. We really like Bar Hop (shown above) for food pints and food! While you are out in Toronto, it’s a good idea to know how paying and tipping work in Canada/the city. You can use cash in the city but basically everywhere accepts card. In fact, it’s arguably the preferred method these days. In Canada, tipping is expected for service. At a restaurant, the amount is generally 15% of the bill but it’s not unheard of to tip higher for really good service. Sometimes large groups have tip automatically added to the bill so watch for that. Even poor service gets a tip – but a lower amount. No tip would be very rude. You can also tip at the bar by tossing a dollar or two to the bartender for drinks – price depending, of course. Tipping well at the bar might mean you get drinks faster all night long.. just saying’. You can catch a Jays Game at the Rogers Centre if you like! If you are looking for things to do in Toronto, you will not have a shortage of options. From sports to festivals and bars and theatre, you will find something to suit all interests! Toronto is a huge sports city – with hockey (Maple Leafs) and basketball (Raptors) at Scotiabank Arena, baseball (Blue Jays) at the Rogers Centre, and soccer (Toronto FC) being the most popular sports. They also have a Canadian football team, Lacrosse team, and smaller sport leagues/levels. In short, it can be expensive to watch live sports (especially Leafs). Jays tickets are still affordable if you sit up high. If you just go to the bar to eat, drink, and watch the game among locals you will have a fun time all the same. As for other things to do – we have a whole post on this. That said, there are many museums in Toronto like the Royal Ontario Museum, the Hockey Hall of Fame, the Art Gallery of Ontario, and more. There are many theatres and musical venues as well like the Princess of Wales Theatre, Massey Hall, The Danforth Music Hall, and the Opera House – to name just a handful! And there you have it – our guide on things to know before visiting Toronto. Of course, we could have dove into each in more detail – but we will leave those for other posts! Hopefully you’ve learned a bit more about the city and look forward to exploring it. Let us know how that goes! As always, Keep Exploring, eh? Hi, we’re Eric and Lisa – welcome to Ontario Away! As an Ontario-born Canadian, Eric has seen lots of his home province while Lisa, his German, is just getting started. Together we plan on exploring every corner of this beautiful province – and will share our adventures with you. We also have another travel blog called Penguin & Pia where we share more travel tips and inspiration about destinations in Europe, North America and beyond. Come say hi! If you prefer to watch videos instead, then why not stop by our YouTube Channel? !